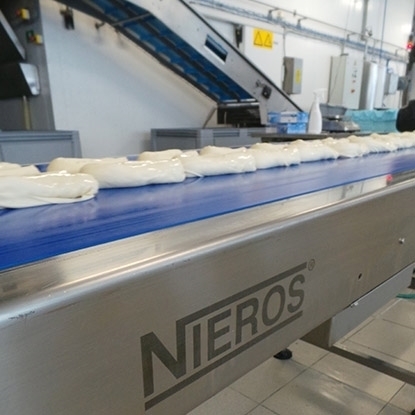 NIEROS® fish processing lines represent comprehensive solutions that cover all the phases of the fish processing industry. Designed for small or complex production plants, each unit is custom-built to match your precise requirements in terms of production process, type of end product and production capacity. Complying with the standards of HACCP, IFS and NSF, the entire production process is fully automated to protect fish meat against deformation and contamination, add value to your products and reduce energy and water consumption. The fish are unloaded into the intake funnel leading to the water-filled washbasin where they are initially washed. Loaded onto a conveyor belt with an overhead nozzle system, they are additionally rinsed. 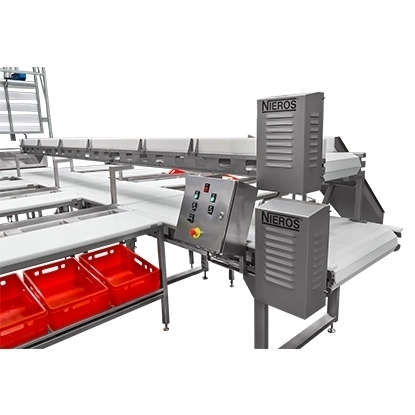 After a thorough rinse, they are loaded into euro crates and conveyed to workstations for individual cleaning, cutting and gutting whereby each fish is gutted by a vacuum pump. Rewashed, the fish are placed into a strainer to have the last remaining parts removed. Once cleaned and loaded into crates, they are ready for weighing, warehousing or transportation.